Despite our rigorous recruiting and interviewing processes, we hired a few management team members several years ago who were not a fit – and the impact was huge. Sendero prides itself on culture, and it was a wake-up call when a handful of managers began to exhibit behavior contrary to our core values. How did this happen? We had made sure each candidate interviewed with at least five people – in different settings, of different levels. We even talked about our core values during the interviews! How did we miss the signs? It turns out we weren’t consistently illustrating how to live our company’s values. While most employees “got it” without explanation, we realized the need to clearly define behaviors associated with each core value – as well as define what the opposite looked like. The first step was easy! We knew our performance expectations related to our core values and using Eric Sinoway and Howard Stevenson’s classification system, quickly created a performance visual map (Performance-Values Matrix) that clearly highlights our belief of the equal importance of business results (what you accomplish) and culture results (how you accomplish it). Looking at our map, it’s obvious that Zombies – those with a mismatch of low performance and low values – must be addressed. However, it’s even more crucial that you identify your Vampires first – those with a high performance and low values match – and act quickly, as their business results can have significant influence throughout the organization. You can then focus your energy on developing employees who exhibit behavior aligned with company values, but need additional coaching to further develop their business results. Lastly, you can’t forget about Stars – those who exhibit high performance and high values match to the organization – as they also need attention to continue growing and developing and remain motivated to perform at a high level. Next, we involved Sendero employees from all levels and backgrounds in a focus group. Using this group and Stephen M.R. Covey’s The SPEED of Trust as a guideline, we started developing behavioral terms for each of our core values. 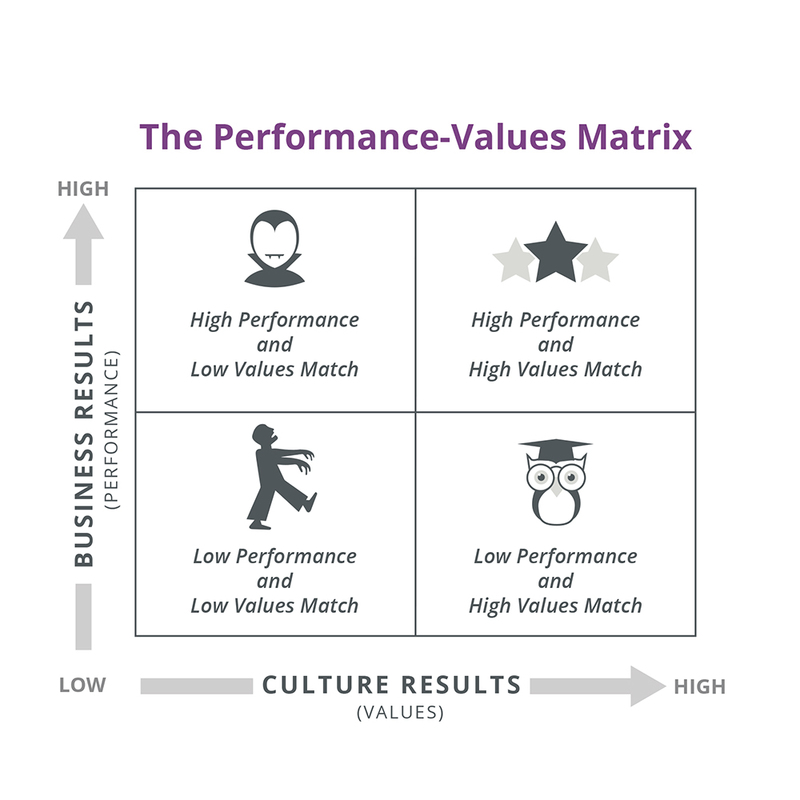 To ensure employees understood expectations regarding their behavior (and that they were held accountable for that behavior), a Culture Behaviors Matrix (an excerpt can be seen below) was created over the next few months. The matrix outlines three to five behaviors for each core value, with specific positive and contra examples of what those behaviors look like day-to-day. It was then used to overhaul both interview and performance management processes. We are now able to hone in on those key behaviors before an individual ever joins Sendero, as well as keep a pulse on how people adhere to our core values. The answer lies in making the invisible (values) visible (observable behaviors) – and then holding people accountable to be good stewards of your culture. We strongly believe that behaviors drive company culture that, in turn, inspires employee performance and engagement. For us, creating our Culture Behaviors Matrix, embedding it in our processes, and holding people accountable has enhanced our interviewing and performance results—ultimately supporting our continued company growth. If you have found similar examples of value misalignment in your workplace–or are looking to prevent them before they emerge–we hope our real-life case study gives you some ideas to try with your own company. The moment you start helping folks build habits in the form of desired behaviors is the moment your organization’s culture begins to transform.